I upgraded to the latest version of elegant grunge and it seemed to fix the issue I was having with IE6 & IE7. My about page no longer gets cut off at the bottom. Thanks for the skin, Michael. Looks nice. I’d like to make the main font a little darker to improve the readability. We’ve got a user population that tends to wear a lot of glasses. I’m guessing I can just swap out a color hex code to change the font color. Can you tell me where in the templates I need to make that change? Thanks! It’s me again. I’d like to put in two thumbnail pictures, side-by-side. When I just insert the thumbnails, they show up on top of each other. I can’t merge the two pictures into one file because then the end result is way too big to view full size. I tried several different things to resolve this but haven’t found a solution I’m happy with. 1) Use the “align=alignleft” tag. When I do this with both pictures, the text jumps up to follow immediately after the picture. This leaves me with most of my paragraphs starting at the left edge of the column and one paragraph starting in the middle of the column, after the thumbnails. Neither a Break nor a Paragraph tag would force the text to continue at the left edge of the column, beneath the pictures. 2) Insert the pictures into a table. This works (though the Captions gave me quite a bit of trouble) with one exception. There is a large chunk of empty real estate between the paragraph above the table and the table itself. It looks strikingly similar to the distance between the title and the beginning of the post. Is a style being applied to tables somewhere, perhaps in the stylesheet? Would love some input on this. Or is there a better way to achieve what I want? Thanks!! Um, silly me. I think I just found the answer to the second question in Gideon’s post above. :) Am I right? Thanks for your help. I’m actually really happy with putting the pictures in a table, but that leaves me with one question. Is there something in the stylesheet that causes there to be a lot of space above tables? You can see the gap here: blog.src.org/?p=49 above the two pictures sitting side by side. New question: On the “Wiki Screenshot” picture, the frame has a funny white block near the bottom. It’s like the caption and the frame aren’t playing well together. Can you take a look at it and tell me if 1) it looks funny to you and 2) if so, any ideas about what’s up? Thanks! Hey Michael thanks for the great theme ! I was wondering, is it normal that the comments do not show up for ‘Pages’ even when the option is checked ? How can I add a link to the header menu to a category page? Jennifer: I’m not actually sure about the space above tables. Feel free to have a romp through style.css and see if there’s anything that looks likely under the ‘content’ section; otherwise just set a 0 or negative margin-top on the table. As far as your frame goes, you’ll need to either turn off framing for that image (by adding a class of ‘noframe’, as in class=”noframe”), and leave the frame as-is, or turn off framing for the image as above, then set ‘frame’ for the class of the surrounding frame, to apply the drop-shadow. Perhaps in a future release I’ll figure out a way to detect images within frames like that, and handle it a bit more cleverly. Ano: I’m not sure, to be honest – probably a question for the WordPress forums. jYO: Just put in an <li> item into the menu <ul>s in header.php, linking to the appropriate location. See the ‘home’ link that’s already there for an example, or seek further assistance in the WP forums. I tried that (using ), but it doesn’t maintain the same formatting as the other links. It shows up as a normal underlined hyperlink. Is the li definitely within the ‘ul’ block? Can you give me a link to an example? 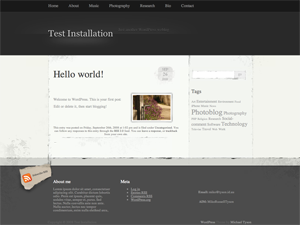 Hi, I’m new to this amazing theme, loved because stilish and because of photoblog. I have some problems with photoblog: although I selected in options to use thumbnails, when I click on “photoblog” tag it shows just the latest post. No thumbnails of others posts tagged “photoblog”. More: it can’t show the widget, placed in the footer bar. Seems like it can’t load anything. Maybe a folder permission issue? Where the system place, or try to place, generated thumbs? WordPress 2.6.3 and your 0.4.4 installed. I just love this theme but I can’t seem to get anything of the photoblog working. I’ve tagged 6 posts with “photoblog” but when I add the widget, it doesn’t show and when I click the “photoblog” entry in the tag cloud, i gives me just one post in stead of 6…. Anything I may have forgotten? I’m having trouble with right aligning images (medium size) in a post. In IE the automatic shadow frame goes across the whole post rather then keeping to the right side. Firefox doesn’t seem to have a problem displaying it right. Any way to make it work in IE? Major: Please excuse the delay in getting back to you; Bram had the same issue, but I missed your message! Please try the beta of 0.4.5, above, and tell me if it fixes your problem! Hi Mikael, Thanks for getting back so quickly. Yes, the beta fixed the problem – right aligned images work. I was thinking that would solve all alignment problems, but it seemed those aligned center also have a problem – you can see it a little farther down on my website. Sorry for not giving a complete problem! Hi Michael, the 0.4.5 beta didn’t fix the problem: I have the first post tagged “photoblog” shown yet, no thumbs, no widget. I have access to my php config on server, you talk about PHP installations with old PCRE libraries. Can you explain better to me, so I can upgrade my php release? I read now that next version will be localizable, I wish to try translating in italian. When I’ll edited the default.po, how can I send it to you? Nathan: Ahh yes, right you are. That took a bit of doing, but the new beta above should fix that problem too. Major: Damn! Actually, upgrading PCRE in PHP is a bit of a job, and one that shouldn’t be necessary. I’m going to email you a debug version of functions.php to try to diagnose the problem. As far as localising goes – thankyou! That’s fantastic. So, duplicate default.po and rename it to your-locale.po, edit it, then email it to me and I’ll include it in the theme. Any questions, fire away, and many thanks! Love the theme. I was wondering if you would be willing to share the photoshop files used for this theme? I am creating a single column version for my own site since I don’t need the sidebar. Thanks for the awesome theme! First I like to complement you on the awesome theme you’ve developed. As you can see I use it for my weblog I started this week. Although it looks really cool I somehow lost the footer of the template. I don’t have a clue how to fix this, cause somebody changed some code in the css. Is it possible to restore the theme to its original shape? Hope to hear from you. I am not sure if it is just my problem, but is there a way to make the avatars in the comment widget show up? I have them turned on in the discussion prefs… Thanks! It’ll be a drop-down selection on the configuration page. JP: Yes, you lost your footer :P That would appear to be both the symptom and the diagnosis. Look at your page source, the footer is gone. Restore it, and it will be back. If you need further assistance, I suggest you post on the WordPress forums. Nathan: Hmm. I dunno! That content is generated by WordPress, so nothing to do with Elegant Grunge. Does it work with the default theme? Try asking at the forums. Thanks! I’m glad you like it! If you have Photoshop (or similar), and the skills to do so, you can just open up the images in the ‘images’ folder of the theme, and just adjust the colours. You probably won’t need to change anything else, I’d say. Hello, love the theme and planning to use it on my new blog. Was wondering though, is there anyway to close the gap between the header and blog entry contents? At the moment it’s quite a large chunk of blank space, and I think I’d quite like to narrow the gap a touch if possible.